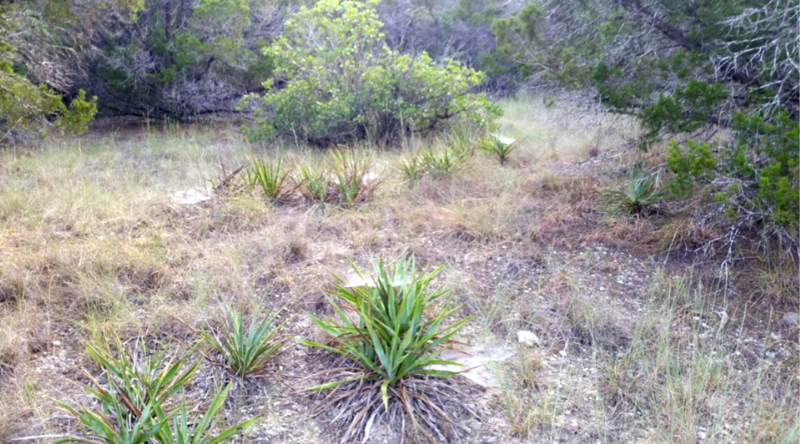 This plant, very commonly sighted along the trails of Wild Basin, is known as Twist Leaf Yucca and is a spring-blooming evergreen with high heat tolerance that is endemic to the Edwards Plateau. If you take a closer look at most of these yucca plants on the preserve you will likely see a web like the one above, which belongs to the Funnel Weaver Spider. The Funnel Weaver constructs its web as a broad sheet below sparse tent threads. The spider’s prey flies into the threads overhead and deflects down toward the sheet, aided by gravity. Once an insect lands on the web sheet, which isn’t incredibly sticky, but still difficult for most insects to maneuver on, it has trouble moving around and is likely get stuck in the sheet. The spider waits in a funnel somewhere on the sheet for this to occur. When the Funnel Weaver feels something on the sheet and detects that it has the vibrational characteristics of possible prey, it races out across the sheet to capture the insect, and then races back to the funnel with its catch. The spider has special, feather-like hairs on each foot that can extend flat when necessary to help it race quickly across the web sheet that most other insects would be unable to navigate. The Funnel Weaver’s proclivity to the Twist Leaf Yucca is probably due to the fact that the yucca plant is airy, which allows insects to fly through while still allowing the spider to create overhead threads and a sheet below. The ecological relationship between these two species can best be described as symbiotic commensalism, because one organism benefits from the relationship (Funnel Weaver Spider) while the other species involved neither benefits nor is harmed (Twist Leaf Yucca). The photo above is a good example of the distribution of the Twist Leaf Yucca and the Funnel Weaver throughout the nature preserve as well as the spider’s tendency to choose the yucca plant for its web. If you look closely you will see that at least 4 of these yucca, all in close proximity to each other, have webs on them.